Playing grooves on the bass guitar is an elusive art form. It takes a long time to figure out what makes a groove…groove. Yes, there’s a method to the madness, and a science to the art. Choose notes from the appropriate scale for the chord. Almost every tune has its own unique set of chords that accompany the music. The notes you choose when playing it need to come from the scales and chords particular to that tune. If your groove doesn’t match harmonically with what’s going on in the music, it’s no longer music; it’s noise. Settle on a finger position. Try to choose notes for your groove that fit into a box (a pattern of notes on your fingerboard that requires no, or very little, shifting with your left hand) The less you shift your left hand, the easier it is to play the groove. You may think that sliding all over your fingerboard looks cool, but the best bassists tend to hold one position for as long as possible. Your hand gets used to a certain sequence, and you don’t even have to think about playing the groove (after you’ve practiced it enough, of course). Make your groove mobile. Some tunes consist of only one underlying tonality throughout, so you don’t have to move your groove around (just listen to some James Brown tunes). In most tunes, however, the chords change as the tune proceeds, which means you have to move your groove to match the chord changes within the tune. With this type of tune, you need to make sure you pick a group of notes that are simple to execute when you move from chord to chord. The list gives you a general idea of what to consider when creating a groove. Now, here are some guidelines in choosing the best notes to incorporate into your groove. 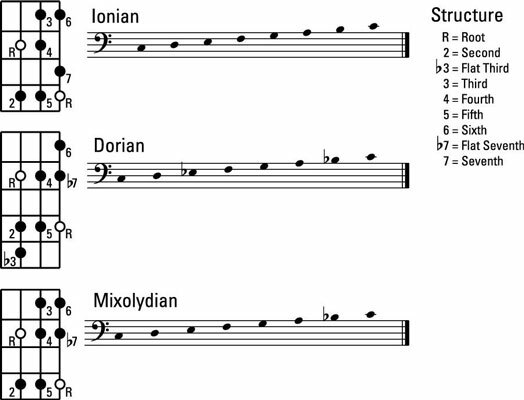 The three most commonly used scales in a groove are the major, minor, and dominant scales. Chords are made up of the root, the 3, the 5, and sometimes the 7 of the scale they’re related to. Root: There’s no question about it; you have to know the root of each chord in the tune. The root identifies the sound of the chord for your band and for the listener. For example, a D minor chord has D as the root; an E dominant chord has E as the root. The root is the most important note in a chord. Your band counts on you to define the sound of each chord for them. That’s why bassists play the root as the first note almost every time the chord changes; so be sure to play that root with authority. 5th: The 5 reinforces the root, and it’s fairly neutral (it fits over any major, minor, or dominant chord). The interval (distance) between the root and the 5 is the same for major, minor, and dominant chords. If you have a lot of chord changes between major, minor, and dominant in a tune, the root and 5 combination is the perfect choice for your groove notes. 3rd: The 3 identifies the chord as either major or minor. Choosing the 3 also forces you to settle on a hand position. If the chord is major and therefore requires a major 3, start your groove with your middle finger on the root to reach all the notes in the scale for that chord without shifting. If the chord is minor and therefore requires a minor 3 ♭ó3), start the groove with your index finger on the root. 7th: The 7 is another excellent choice for a groove, especially if the chord is minor or dominant. Both minor and dominant chords have a ♭ó7. If the chord is major, the 7 is commonly substituted with the 6 because it’s just a more pleasant sound. 4th: The 4 is a great note to play as a passing note (an unstressed note that you play on your way to the next important note). A passing note adds a little spice to the groove (it gives the groove an interesting sound). Just be careful not to emphasize a passing note, because doing so tends to obscure the chord. However, keep in mind that an emphasized passing note makes a good choice if you intend to play an ambiguous groove. 6th: The 6 is a good choice to play as a neutral note. 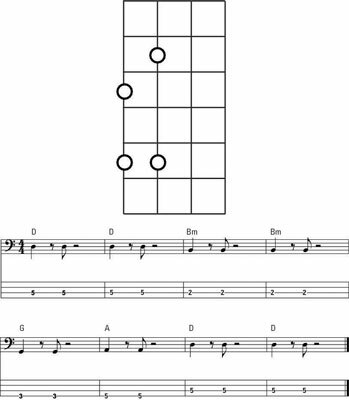 In other words, no matter what your chord is, the 6 will generally fit. As with the 4, you don’t want to emphasize it too strongly, though. Using the 6 as a passing note is ideal. Passing notes are used to smooth the passage from one strong note to the next. 2nd: The 2 isn’t exactly a terrific choice to include in your groove. It’s too close to the root (only two frets away), so it clashes, and it doesn’t give your bass line enough variety. However, the 2 can work as a passing note.